Alan Rath, Forever, 2012, pheasant feathers, aluminum, polyethylene, fiberglass, custom electronics, motors, 90 x 60 x 12". There’s a serious flirtation factor to Alan Rath’s recent mechanized sculptures. Composed of metal armatures and computer hardware that seemingly animate feathers, the works literally tickle the viewer who stands even a socially acceptable distance away. Working with robotic forms since the 1980s, Rath has always captured a dynamic confusion between electronics and human intimacy, utilizing standard tech-art hardware—video monitors, audio equipment—as stand-ins for the human body. At Hosfelt he doesn’t hide the tripods and consoles, but the addition of an organic material is a breakthrough, making the nine new works a different kind of animal, pun intended. The freestanding sculptures, triggered by motion sensors, enact mesmerizing, uncannily lifelike sequences that recall dance (the artist admits to being inspired by Chinese opera). Long brown pheasant feathers flutter and shimmy in circular formation in Absolutely, 2012, a tall piece that resembles a palm tree. The feather fronds undulate and wave; they stiffen like tails of frightened felines. Each work embodies a very different personality. Fa Fa Fa, 2013, is fitted with white ostrich feathers, a material that conjures a burlesque dancer’s fan routine. The feathers are configured in a tight formation and express a playful ambivalence, cramping together before splaying outward to coyly reveal a mechanical heart. 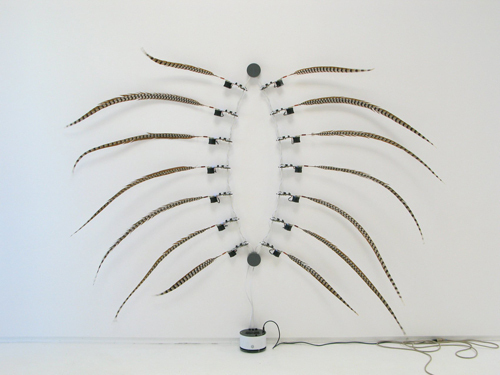 Two circular armatures, each with a single long feather, mirror each other’s movements in Roto II, 2013. Rath implies a relationship between the objects, which, while mostly tracking each other, occasionally strike out on their own, managing some kind of dissonance as they express autonomy—a flamboyant, mating-dance version of Felix Gonzalez-Torres’s Untitled (Perfect Lovers), 1991. As Rath’s sculptures go through their paces, the electronic clicks and groans of gears in action add a sound element that is also strangely anthropomorphizing. Forever, 2012, is an almond-shaped wall work whose form suggests a tortoise. The feathers flap and the sculpture seemingly strains to take flight, while metaphorically it soars.